Before you start a diet, do you ever just go for an all out, ridiculous splurge? 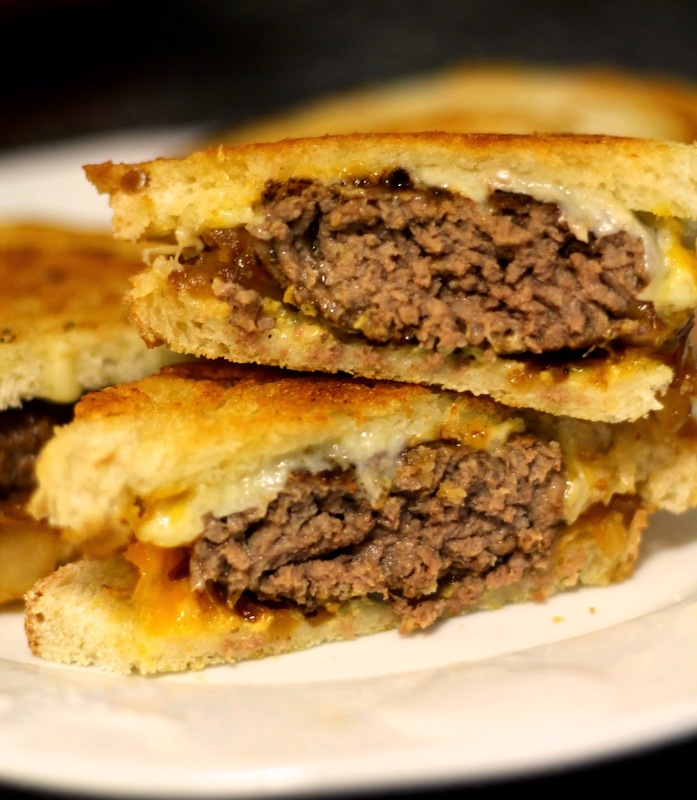 I know I shouldn't, but it's not all bad because that's how this Grilled Cheeseburger came into existence. Inspired by my favorite grown up grilled cheese, this burger edition just might be a game changer. 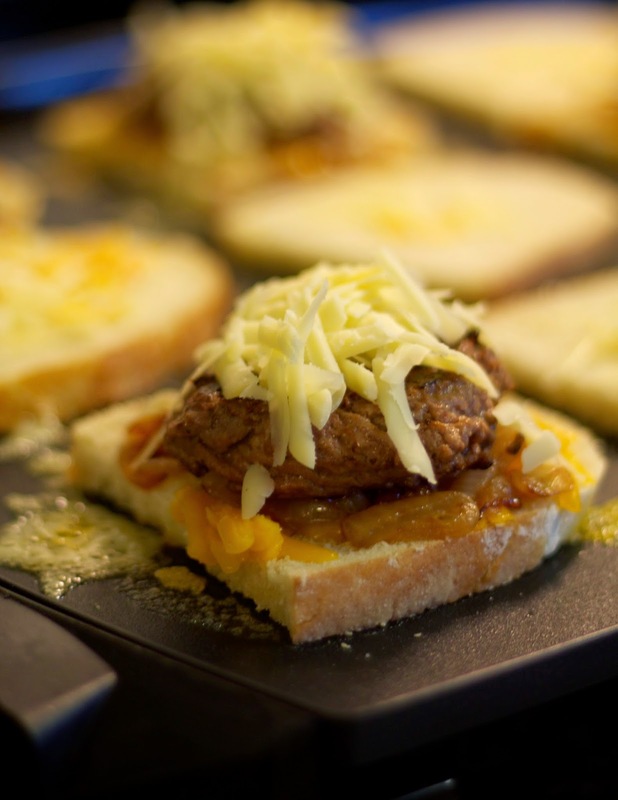 The burger itself is pretty similar to a patti melt, with two types of cheeses, plus a layer of sweet, delicious caramelized onions. Since this is quite the hearty indulgence, I created six smaller sandwiches by halving the larger pieces of italian bread and using smaller beef patties. That's a moot point because I ended up eating two and a half of the sandwiches, but my intentions were good! Begin by caramelizing the onions. Heat a skillet to medium heat and add olive oil and 1 tbsp. butter. Add the onions and cook until golden brown, stirring often (about 15-20 minutes). Heat a griddle to medium high heat. Divide the beef into six even patties (press them thin) and season each side with salt and pepper. Add a tablespoon of butter to the griddle and then the beef patties. Cook roughly 3 minutes per side, or until done. For the sandwiches, spread dijon mustard on one side of half of the bread slices (or all of the slices, if you're into mustard!). Wipe down the griddle to remove any of the beef drippings, then add another tablespoon of butter. Add all of the bread to the griddle, then divide the gruyere among half of the slices. Top with a spoonful of caramelized onions, then the burgers, and top with cheddar cheese. When the bread is lightly toasted and the cheese is starting to melt, top the sandwiches with the second bread half and carefully flip, adding more butter to the griddle as needed. Continue cooking until the cheese is completely melted. Enjoy! No lie.. I am waiting on my husband to bring home dinner for me to cook.. and this photo isn't helping my hunger. I AM STARVING! This looks amazing! Pinned!